Here is the first release in 2019 of the as sympathetic as it small label Tiny Room Records. Label owner Stefan Breuer releases a new album under the name The World of Dust. This time in a collaboration with Todd Tobias, who the readers of this blog were introduced to through the release of that fine, surprising album 'Massabu Evening Entertainment' close to a year ago. On Samsara the duo explores songs that are as calm as they are tranquil. Samsara, Sanskrit for moving around in circles or the process of reincarnation, is an album where the brake is on for most of the time. In that sense the music on the album comes close to the resignation that comes through living sort of forever. The reward is always in the next life until nirvana is reached. I fully realise that the description of the music given just now may give off the impression it is utterly boring. And I can imagine that if I play it at the wrong time it is. Were it not that in the calmness The World of Dust finds a pop feel, that is rather infectuous. Some pop songs of the 60s are no stranger to the tandem Breuer - Tobias nor are the 80s. The soft side of Tears for Fears, like 'The Hurting' or 'Mad World' shines through here as does the mysticism of Japan. Think 'Nightporter'. Listen to 'Naked Science' to know what I mean. It is here where Samsara fully succeeds and delivers. It is of no consequence that fun and exuberance are left behind as long as the songs deliver an inherent quality. And that they do. I can lose myself in the harmonies of 'Space Shelter'. Nothing but an acoustic guitar, elementary played and Tobias harmonising with himself is all it takes to have a beautiful song. 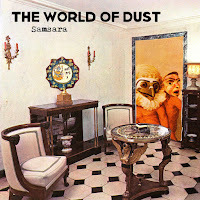 When I play Samsara and invest in the listening, I find it is so easy to sort of melt into the album, following all the small changes closely, coming into the mood The World of Dust presents totally. With a minimum of effects the album draws me in and does not let go before the final note has faded away. Samsara is a beautiful album if you allow it to be and I decided that it is more than worthwhile to invest. The result is a time well spent.